The City elite is ready to try something new – are clients keeping up? Eighteen months ago I met the general counsel (GC) of a FTSE 250 company to listen to his plans to parcel up parts of his deals, based on complexity, and hand each chunk to a different panel adviser based on skillset, capability and cost. 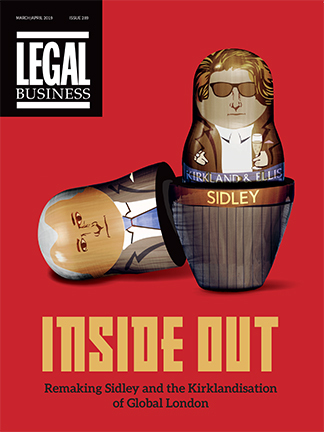 Until very recently, this level of micro-management – and the prospect that law firms would no longer be handed a deal lock, stock and barrel – was not going down well. Not long after meeting this GC, I sat between two well-known managing partners at a dinner and listened to them assert matter-of-factly that this sort of tinkering round the edges would never become mainstream. Having worked her way up Nationwide‘s ranks to group general counsel, Liz Kelly is to leave the building society at the end of the financial year to spend more time with her family. Kelly was appointed as general counsel in 2009 and has since pulled together what was a fractured legal department, creating a risk-based blueprint for areas where it needed to grow and building it up to around 50 lawyers, including seven litigators. Thanks to the economic turbulence that has plagued the Irish nation since 2008, Dublin’s largest firms continue to collect hefty recession related work post financial crisis, including most recently an appointment to advise the government’s asset and liabilities manager, the National Treasury Management Agency (NTMA). While the trend of in-house departments bolstering their internal capability and cutting reliance on external counsel is well established, Royal Dutch Shell’s legal head Peter Rees QC has taken the logic to the extreme. Despite the pressure on in-house teams to reduce their legal spend and keep as much work in-house as possible, demand for external legal services has still managed to grow. The in-house specialists who took part in this survey spend an average of 49% of their legal budgets on external legal advice, while 44% said demand for external legal services had increased in the last year, while 40% said demand was unchanged. This is despite the fact an overwhelming 67% of respondents say their companies now have a policy of retaining more matters in-house to reduce legal spend. While the contradiction is confusing, the upshot is clear: in-house teams need their law firms now more than ever.